When you click one of the Standard Questions, it will automatically create the question below. This gives you the ability to mix it in with your custom questions and create the order that works best for your race. 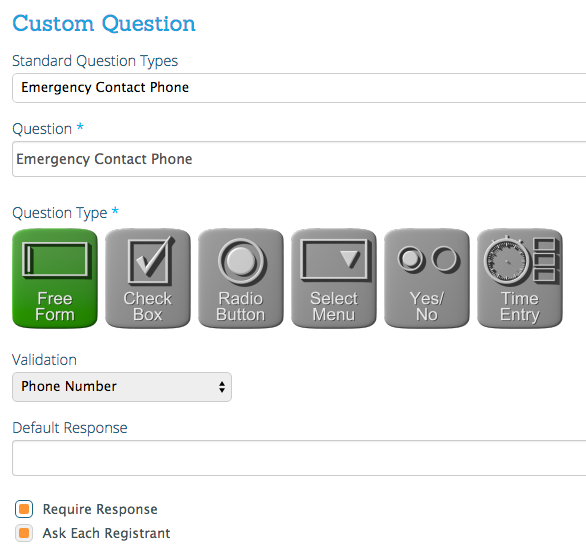 Note that the Standard Question will automatically select defaults such as the format and who to ask. You will only have limited capability to change these questions. For example, the phone numbers must be phone numbers and for emergency contact each participant is given the chance to enter their own emergency contact, but you select whether it is required. If you have an existing question, you can turn it into a Standard Question. We highly suggest you do this if you have an Emergency Contact question. The advantage of having Standard Questions is that users with a profile will only have to answer it once. The next race they sign up for, the Emergency Contact info will automatically populate – saving time and making mobile registration easier. This is part of our effort to move toward a “One Click” registration capability.